Killarney is home to some of the most stunning natural scenery in Ireland. From Muckross House & Gardens, Ross Castle, Torc Waterfall, and of course the spectacular Killarney National Park, they are no shortage of idyllic locations to explore and even be brave and go down on one knee. Killarney offers something for everyone and they are an abundance of activities nearby if you’re interested in a more active romantic break. Ideal for those looking to spend quality time with their partner, the Angsana Spa offers you the perfect treat for relaxation and rejuvenation. 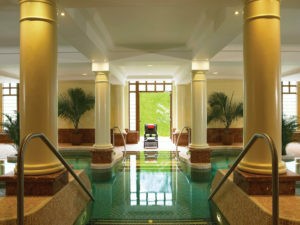 Located at The Brehon Hotel Killarney – Angsana Spa’s are only located in areas of spectacular beauty. All Spa therapists are trained exclusively at the at The Banyan Tree Spa Academy in Thailand and are designed to refresh and rejuvenate mind, body, and spirit. To find out more about the Angsana Spa why not click Angsana Spa for more details. Imagine trekking through the spectacular Killarney National Park for hours with your loved one this Spring, both of you on horseback taking in the breathtaking views of the Killarney Mountains, Lakes, and natural beauty of the area. Killarney Riding Stables makes this a reality with a choice of treks through the national park with supervised guides to aid all levels. 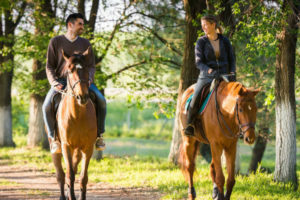 Approved by the Irish Tourist Board and the Association of Irish Riding Establishments, Killarney Riding Stables is also the home to over 70 horses and is the perfect choice for you to make your Valentines Day exceptionally memorable. To find out more information please click here. 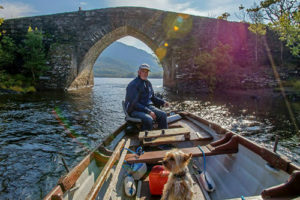 The Lakes of Killarney set upon the spectacular backdrop of the glorious MacGillycuddy Reeks is exceptional spectacular, and one of the most most romantic choices to explore Killarney is choosing a selection of boat tours that are available from Ross Castle. 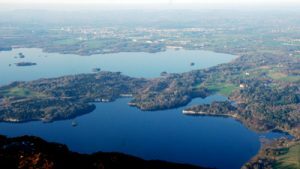 Choosing either a traditionally styled boats or an enclosed vessel, you will explore over 30 magical islands on the lakes of Killarney. One of Killarney’s forefront tourist attractions, Torc Waterfall is also one of Killarney’s most loved attractions. Located just a few kilometers outside the town, Torc Waterfall is 200 meters high and nestled at the base of Torc Mountain. 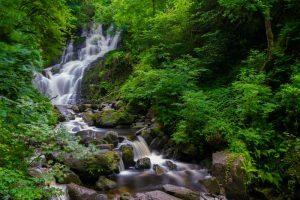 Exceptionally memorable after heavy rainfall, the setting of Torc Waterfall is very romantic and offers spectacular panoramic views of the town and the Lakes of Killarney. 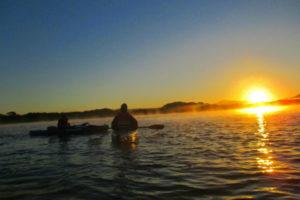 If you both love the outdoors then Kayaking in Killarney is a must see if you decide to head to Killarney for Valentines. Kayak from Ross Castle right through to Lough Leane to Innisfallen, and experience some of the most dramatic scenery imaginable. Discovering wooded & rustling islands, limestone caves, and kayak past sleepy swans on the Lakes of Killarney, Kayaking in Killarney also offers you the chance to discover Killarney’s past with the mystical 6th-century abbey ruins on Innisfallen Island well worth a visit. No previous kayaking experience is also required, so no excuses. Visit Mór Active Tours for more details by clicking here. The Kerry Way is deservedly known Ireland’s most famous long distance walk as well as its longest. This 215km walking route is closely associated with the majestic Ring of Kerry. One of the best ways to discover Kerry and its wild beauty, The Kerry Way is ideal for exploring with your partner and starts and finishes in the spectacular Killarney National Park. Majestically located on the shores of Lough Leane, this 15th century Castle, looks out on Innisfallen island, and was once a school of learning and home to the most magnificent Abbey founded in 640 AD by Saint Finian the Leaper. It is said that High King of Ireland Brian Boru was educated here. 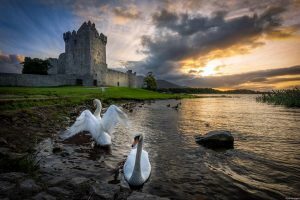 Regarded as a photographers paradise, Ross Castle is an area of immense beauty and its imposing features, located just 2km outside the town, is surrounded by a tower house and walls and even more round towers. A must see for couples the close proximity to town coupled with the idyllic setting on the shores of Killarney, make Ross Castle a must see this Valentines. 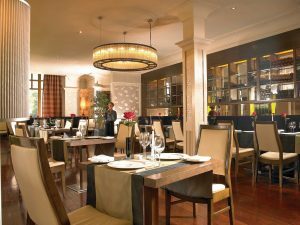 Carefully curated by Head Chef Chad Byrne, Danú at the Brehon Hotel in Killarney is well worth a visit. Their menu offers fun, flavor and freshness in a relaxed and casual setting. With a selection of dishes from vibrant small plates to hearty mains, signature favorites to quirky take’s on the classics, their food is a celebration of local produce, market fresh ingredients, and a talented kitchen team. A shining light of the burgeoning Irish food scene, Chad and his team grow their own herb garden, work in tandem with some of Ireland’s best food producers and collaborate with their industry peers. All this to bring you food that is as inspiring and as it is delicious in a place that is as beautiful as it is relaxed. Danú’s private dining room offers you the perfect romantic setting for a romantic dining experience this Valentines. 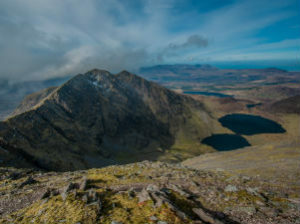 Although the summit is 535m, Torc Mountain is one the easiest mountains to climb in Kerry. But even better, there’s a clear trail in place. Steep and Rocky in places, Torc Mountain will certainly be memorable and is a good workout even for the super fit. Better still the summit of Torc Mountain offers spectacular views of Killarney and its natural surrounds and takes overall roughly 2 hours to complete. A rocky path and sleepers are also there to help you as a guide during your trail and is well worth a visit this Valentines with your partner. Killarney is often renowned for its jaunting car experiences and for the wit, humor and storytelling of the local jarveys. 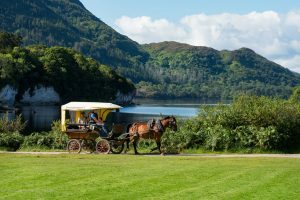 Jaunting Cars are one of the most spectacular ways of viewing Killarney and provides a wonderful way to view Killarney’s most well-known tourist attractions such as Muckross House & Gardens, Gap of Dunloe, and Torc Waterfall.